We generally have less orchids in flower in the summer than other times of the year as most species are in the middle of their growing season. It is therefore great to have some species in the collection that flower throughout the year. 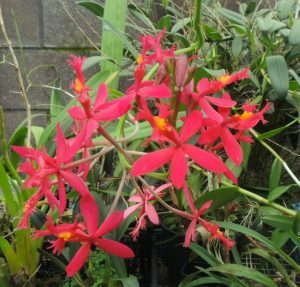 One species that is always in flower in the greenhouse is Epidendrum radicans. This is a very unruly plant that grows long canes up to 2m long with terminal flower spikes, however the flower spikes continue to produce flowers for more than twelve months and at any time they carry 10-15 really attractive flowers that are bright scarlet. We have seen the species growing in Costa Rica in wet secondary forest at around 1400m altitude where the plant starts life at or near the ground and then scrambles up through the scrub. It has an interesting habit of developing twisting flower spikes that cling onto surrounding plants both in the wild and in cultivation. The flower spike shown here is well away from the pot it was once in and provides an unexpected and welcome burst of colour amongst neighbouring plants. The species is butterfly pollinated.